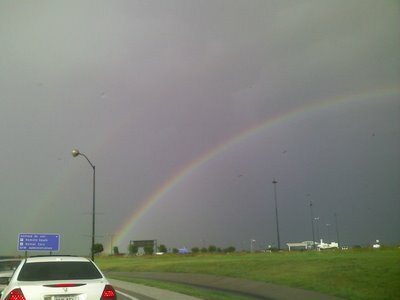 Yesterday when I was driving home in a rain storm I saw this rainbow and it made me think of you. It was actually a double rainbow but you can't see it very well in this low quality picture from my cell phone, but it isn't as bad as some of Mark's photos. Now today, I am writing as many haiku as I can for a contest and one popped for you. Oh, Cheryl, I love this. Thank you!